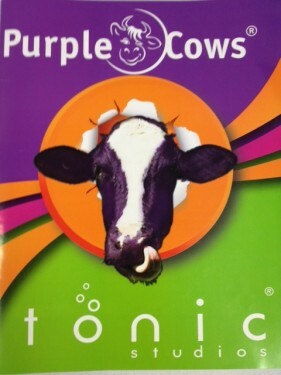 As some of you may already know, Tonic Studios and Purple Cows have joined forces. 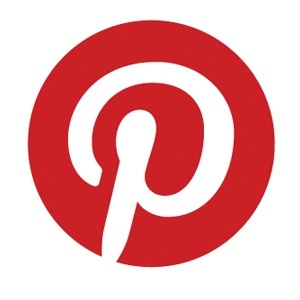 Please visit www.purplecows.net and the Purple Cows Blog for new projects and ideas. This blog – Tonic Gallery – will no longer be updated. Thanks to all of you for your continued support of Tonic Studios over the years, and for keeping up with me here on the Tonic Gallery blog! There are new and exciting things coming from Tonic Studios – make sure to check it all out! Hello! 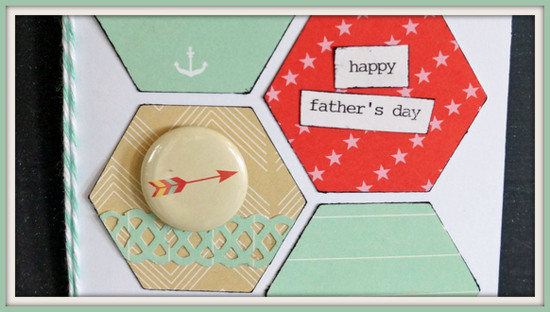 Amber here, with an easy Father’s Day card to share with you, using the Doily Strip Punch. Yes! 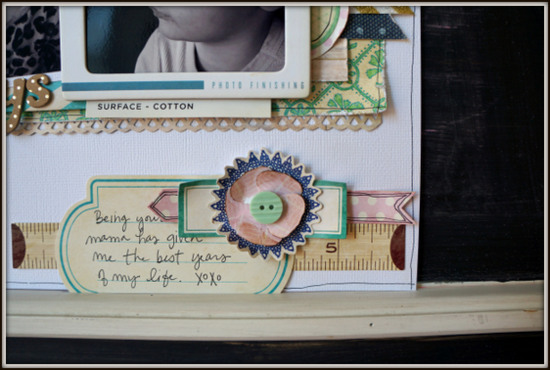 The Doily Strip punch on a masculine card!! First, I chose my patterned paper. I started with 6 patterns in 3 different colors. Punch out 8 hexagons, ink around the edges and set aside. 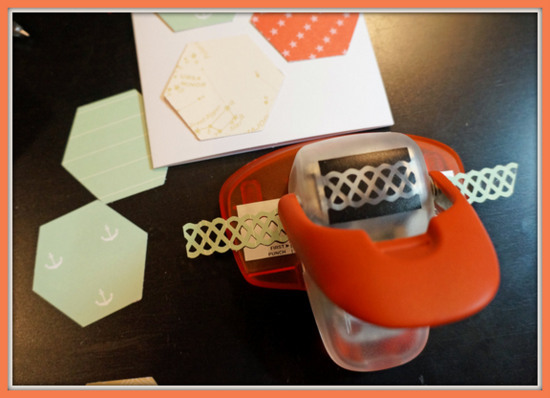 With a solid coordinating color, use the Doily Strip Punch to punch a 6-8″ strip. 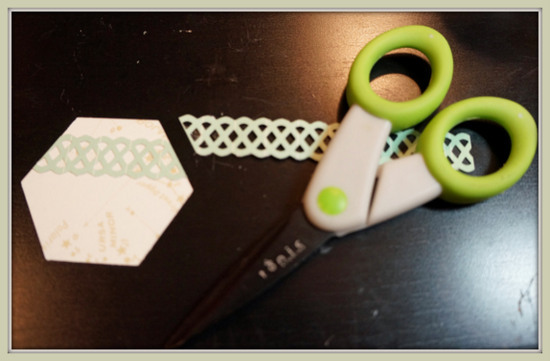 Apply adhesive to the back of the Doily Strip and adhere to two hexagons. Rub away any visible adhesive with your fingers. Cut excess strip off. Adhere the hexagons down the center of your card. Add embellishments, twine and sentiment. And there you have it: a quick and easy Father’s Day card! 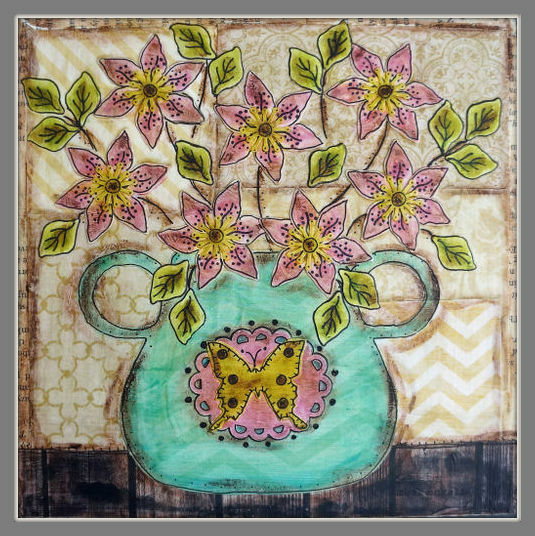 Cheerful Mixed Media with a Modern Folk Art Flair. Original Artwork. Custom Pieces Available. For all you mothers – we hope you had a delightful Mother’s Day! We have a charming card to share with you that is sure to make Mom smile – even if it’s a little late! I used the Petal Pairs Set 1 to punch out flowers in two shades of pink (five of each for this card). Using my Cricut, I cut out a small pitcher and then punched out a small scalloped circle, to which I stamped “mom.” I cut two pieces of paper to layer for the background and distressed the edges with the Tonic/ Tim Holtz Distress Tool. Using my Tim Holtz scissors, I hand cut an oval shape for the table and also five stems for the flowers. Using a black pen, I outlined the stems, pitcher, scalloped circle and doodled around the table. Next, I used the Tonic/ Tim Holtz Retractable Craft Pick to poke two holes in the top of the scalloped circle. I wrapped a small piece of black twine around the pitcher and tied it in the middle of the circle. I then used a pop-dot to adhere the circle to the pitcher. Now, we’re ready to adhere the rest! Using a tape-runner I adhered the table and stems. Then, I pop-dotted the pitcher and two of the flowers. Finally, I added five bright pink rhinestones that give the card a little extra sparkle. And there you have it, a bouquet of flowers guaranteed to last longer than fresh-cut ones! The love of being a Mama! Hello! 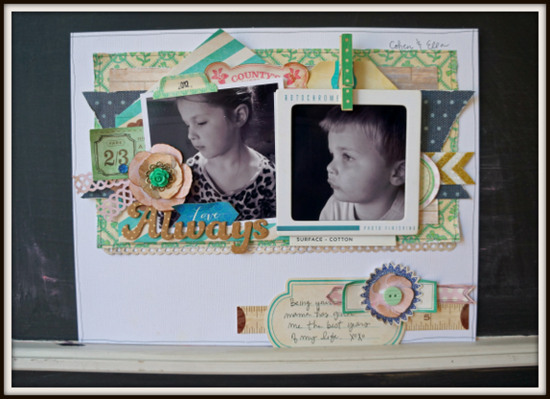 I made this 11″ x 8 1/2″ layout using Tonic Punches and the “Maggie Holmes Collection” by Crate Paper. With Mother’s Day right around the corner, I thought I’d make a page simply to express how much I love being “Mama” to these two kiddos. To embellish the patterned paper’s already feminine feel, I used the Pick of the Bunch Punches, making both a small and large Pansy. (The large Pansy is layered with a second, smaller Pansy). I distressed the edges with Ranger Distress Ink and once I had the petals secured together, I bent them upward to help them stand out a bit. Finally, I added a resin flower embellishment and a button to the center of both flowers. Next, I used the Simplicity Doily Strip Punch as a border under my photo grouping and then two more, smaller pieces in place of leaves, next to the large Pansy. Before adhering everything down. I used the Tonic Paper Distresser to rough up the sides and give the page even more definition to it’s already layered look. 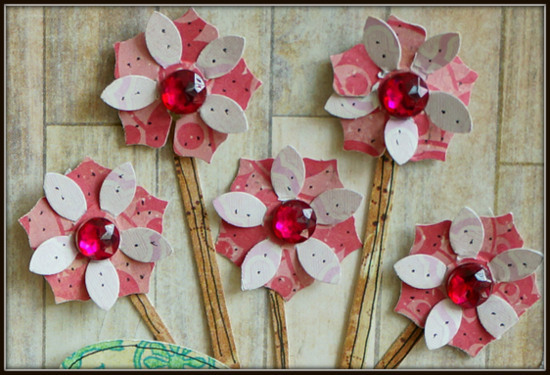 Tomorrow, I have a couple of Mother’s Day cards using the Petal Pairs Punches! Wow! 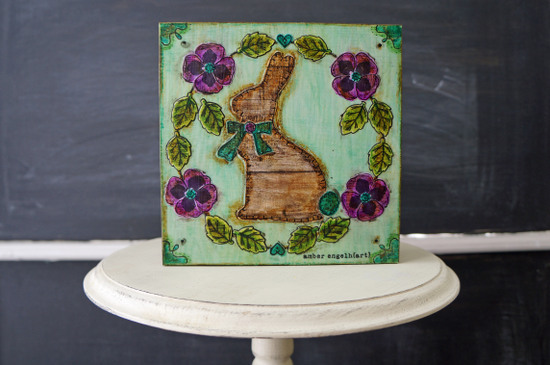 So excited to share another delightful project from Amber Engelhart today! 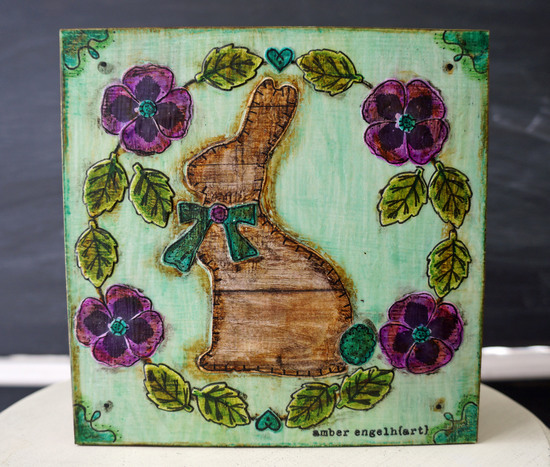 Today’s project is an adorable little 6″ X 6″ bunny box featuring more of the Tonic Studios Pick of the Bunch Punches. Oh how I’d love to have this decorating my home this Spring! I’m so excited to share a new talent with all of you today! Amber was introduced to me a few weeks ago by my good friend Trisha, and I’m head over heels for her beautiful work! We got a few of the new Pick of the Bunch punches to Amber and she created a couple masterpieces that I couldn’t wait to share with you! Hi there! My name is Amber Engelhardt. I’m a wife of 10 years and a very grateful stay-at-home mom of two kids: Ella (6) and Cohen (3). I became an artist the second my mom placed that first crayon in my hand! I even went to an art-focused Elementary school. 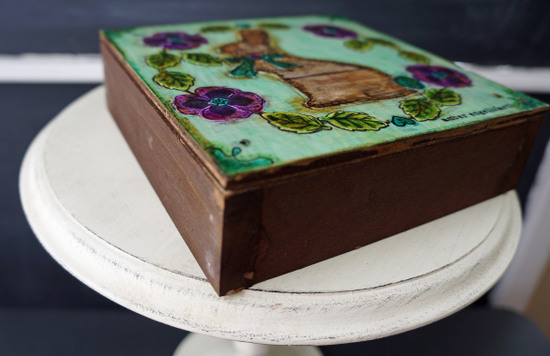 In high-school I became interested in collage and loved cutting out pictures from magazines and adhered them to shoe boxes to make “memory boxes.” I started scrapbooking 13 years ago, when I was in college, and I’ve loved it ever since. Recently, I’ve found a way to combine both my love for collage and scrapbooking through mixed-media art. 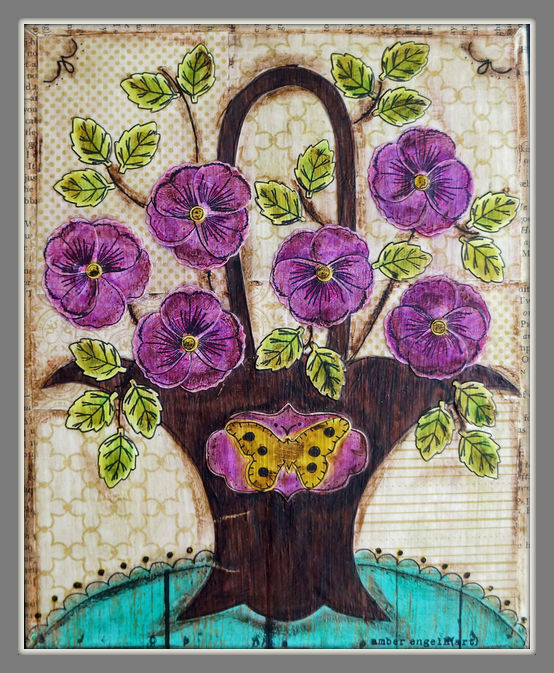 I’ve had a long-time admiration for folk art and it has been a goal of mine to make art inspired by folk artistry, but modernized with current color combinations and patterns. This dream led me to open my own shop on Etsy, called Amber EngelhART (http://www.etsy.com/shop/amberengelhART). 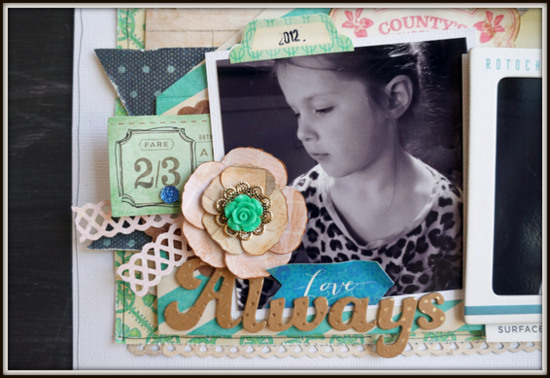 When I make a canvas or shadow box, I use a combination of hand-cut and die-cut designs. 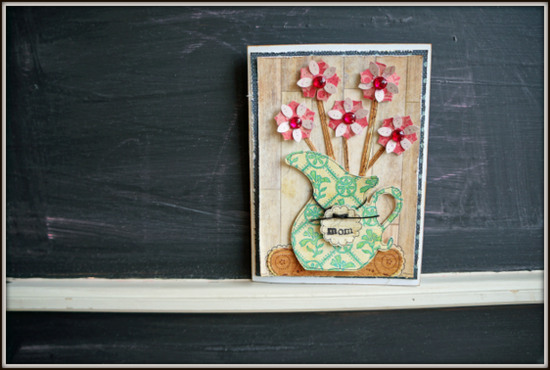 I also use punches, like these ones made by Tonic from the “Pick of the Bunch Floral Designs” collections. I start with scrapbook paper and then cut my designs, usually following a design from my sketchbook. After punching the Tonic flower petals and leaves, I used the “Pick of the Bunch” stamps, giving the flowers beautiful and instant detail. For this project and any others where you use markers or watercolors to color the punched images, it is important to use a waterproof ink pad. (I use Ranger’s Archival ink in Jet Black). Once I have it arranged, I adhere it with Matte Mod Podge. When that is completely dry, I use a fine point Faber–Castell black pen (also waterproof) to outline the rest of the details. Next, I watercolor over the entire project using Distress Stains by Ranger and Tim Holtz. This intensifies the current colors of the scrapbook paper, often times making the patterns unrecognizable. Finally, I get to play with India Ink markers to provide shading and details (I use Faber-Castell PITT artist pens). I use my fingers to blend the colors, finishing with two shades of brown to give the piece an aged look. The dried finish of the Mod Podge is what allows me to blend the markers; otherwise the ink would simply soak into the paper. The very last step is to cover it with one coat of Mod Podge, sealing and waterproofing the artwork. Click each image or a close-up. I love all of the steps I use to complete a canvas- but I know it’s time consuming….and not everyone’s cup of tea! You could still have a beautiful, one-of-a-kind piece of artwork without the water colors or the markers. Using the Tonic punches definitely gives you a great starting point! Thanks for letting me share a little bit about myself and my creative process. I’d love for you visit my blog: www.amberengelhardt.blogspot.com, where I share mixed media, scrapbooking, photography and crafts in general. 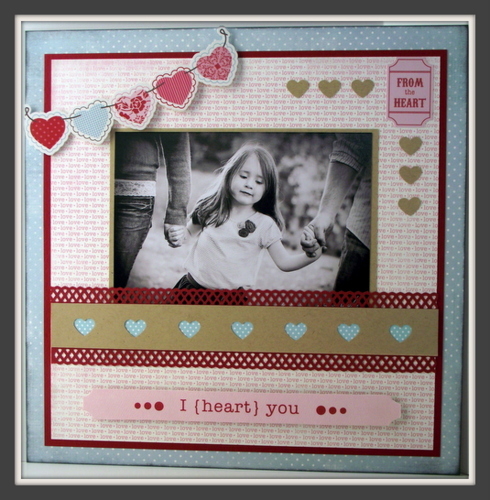 A layout by Amy to put a touch of love in the air! 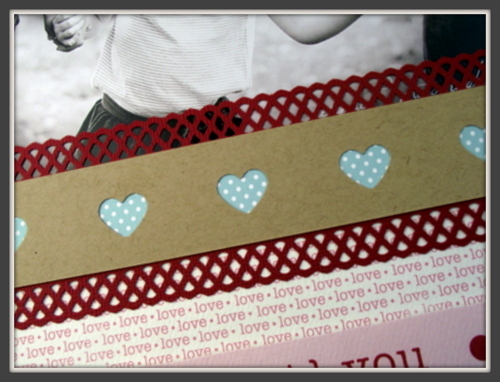 Amy used the Heart Mini Boot Punch and the Simplicity Doily Border punch to make the lovely border strip that goes across the page. Paper and embellishments are from Carta Bella’s Devoted collection.